Engel, the injection moulding machine manufacturer and system supplier headquartered in Schwertberg, Austria, generated some€935 million in revenues in the 2013/14 fiscal year, following substantial turnover growth in the previous fiscal year. For the current fiscal year, which ends in March 2015, the company group expects 7% growth in turnover. For example, Europe is currently suffering from a drop in Russia, its third-largest market to date. At the same time, the second largest market, Turkey, has overcome its weakness and is again showing positive signs. Germany continues to take the number one spot and demand has again shown steady development here. Due to the growth in other markets Engel can compensate the decline in Russia. Dr Christoph Steger, the CSO of Engel, said that from a global viewpoint, the fact that India is slowly waking up again is a positive signal. China, the USA and Mexico continue to be Engel’s fastest growing markets. In North America, the trend is driven by strong growth in demand for innovative processes and solutions for high-performance applications. Engel generated some 54% of its turnover in Europe, while America accounted for 25% and Asia for 21%. In 2014, the market share increased further, especially in Europe and Asia. By industry, packaging and medical in particular exhibited global growth, according to Engel, and a differentiated appraisal is necessary in Automotive. While reinvestment continues to decrease slightly and capacity increases are slackening, investment in innovations is on the rise. Directed fibre systems have long since established themselves in high-performance products – for example, aerospace industry. For composite materials to find even wider use in high volume applications, such as automotive, the biggest challenge at present is to develop manufacturing processes that allow for low unit costs despite high-volumes. 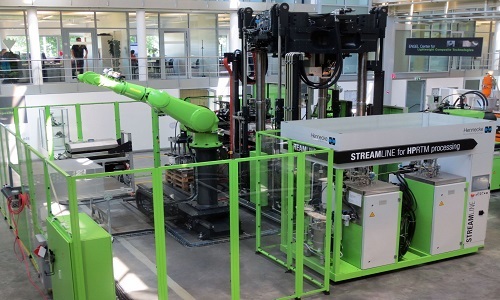 Dr Neumann emphasised the need to offer thermoplastic solutions across all industries in order to achieve a genuinely widespread breakthrough, and injection moulding technologies offer great potential for this. To push the development of new processes forward even faster, the company established its own Center for Lightweight Composite Technologies in 2012 at the site of the large-scale machine plant in St. Valentin, Austria. In collaboration with its system partners, ENGEL was able to set several milestones in recent years. Process integration and automation are two of the strongest innovation drivers, as reflected in Engel’s exhibits at Fakuma 2014. “The trend towards automation is particularly pronounced in the emerging markets, such as China, Southeast Asia and South America,” said Dr Steger. Automation is increasingly an integrative process component, which not only makes the production processes more efficient and economical, but also empowers totally new manufacturing methods, component properties, design solutions and product qualities. On top of this, automation and process integration improve the sustainability of many applications. Integrated processes typically need less energy and raw materials, by removing entire process steps along with the logistics overhead for intermediate products. The markets in Western Europe are the early adopters of highly-automated and integrated processes, but they still offer growth potential. Engel ensures an uninterrupted supply of specialists through in-house training, and not only at its plants in Austria. The German subsidiaries are also highly committed to sponsoring young specialists. In 2012, ENGEL Deutschland started to train process mechanics at its Hagen facility; the newest of the four German subsidiaries, the ENGEL Deutschland Technologieforum Stuttgart, is planning to boost its support for academic training in collaboration with regional partners. At Engel’s large-scale machine plant in Shanghai, 10 young men started their training as CNC technicians in March this year. Engel has established a new training centre in China based on the role model of the training workshop in Schwertberg, Austria, which has attracted state awards, exporting the dual vocational training system that is practised in Europe to China. In contrast to most other apprentices in China, Engel trainees gain a thorough practical grounding on the job from the first year onwards, and also receive payment. With its dual vocational training program, Engel is a pioneer, and one of the most sought-after employers in Asia. “Finding qualified staff in China is difficult because state education does not measure up to our high requirements in many areas.” Said Dr Neumann. “This is what prompted us to establish our own training program in China, and thus strengthen the ties between our staff and the enterprise. Are Asian PET markets stabilizing?